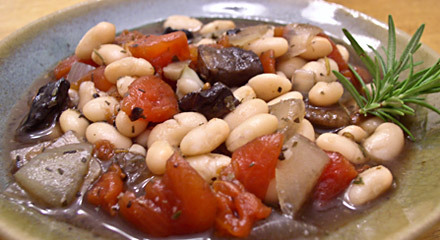 Heat a large non-stick skillet or casserole over medium heat, and sauté the mushrooms for 1-2 minutes. When mushrooms begin to exude their juices, add the garlic and continue to cook, stirring, for another minute. Do not allow the garlic to brown. Add tomatoes, mushrooms, thyme, basil, rosemary, and bay leaf. Stir and bring to a boil. Add onions and salt and pepper to taste. Return to a boil, cover and simmer over low heat for 15 minutes, stirring occasionally. Remove and discard the bay leaf. Mix in the beans, and simmer over low to medium heat until beans are warmed through, about 5 minutes. Add water, if necessary, to keep ingredients moist. Adjust seasonings and serve. Adapted by: Susan Voisin from a recipe at http://www.coopfoodstore.com/. is it 1 tsp fresh or 1 tsp dried rosemary? Made this tonight. Absolutely delicious. Will make this again for sure! Bubbling away on my stove right now … the smell is divine, and the few bites I’ve taken were awesome! I threw in a large handful of chopped fresh spinach. Yum! I’m serving it with corn bread. Great dinner! i absolutely loved this dish! while i was making it my sister asked me what was the delicious smelling thing i was making lol. and she is a meat eater. the seasonings were a bit much but i LOVED the taste and aroma of the cassoulet. it is to die for. i will be making this again and again! and it’s so simple and looks beautiful :)but next time i will chop the onions and mushrooms bigger and keep half a can of the tomato juice… thanks! We liked this too and it was super easy to put together. I sauted the onions with the mushrooms and served over mixed grains. I might add some red wine next time. Thanks! We also used red wine and I used roasted garlic. I omitted the onion and used pressure-cooked beans. This was great and a re-do!! Just made it and just had it for dinner. YUM! This will become a regular. My only change: I had a half cup or so of red wine in the fridge…the bottom of a bottle. I figured that it was traditional to cassoulet, so I added it after “sauteeing” the mushrooms and onions (I let the onions cook up just a little, like one of the other comments (no oil). Also, rosemary and thyme are ready in my garden, so, rather lazily, I just tied a bunch up with kitchen twine and tossed it in to retrieve later. Adding the wine and cooking it down added maybe 10 minutes to the recipe. I felt guilty having something called a cassoulet come together so quickly. But not TOO guilty! It is fantastic. Thank you for another great meal! I really liked this one. It didn’t say to drain the tomatoes though and I found it a little soupy. I also sautaed my onions before adding the mushrooms. I like soft onions. I just made this tonight for my wife who gave it a solid “thumbs up”! Thanks for another great recipe. This is so yummy! I am eating it as I write this. I also have 7 sprouted grains toast and it is all you need! I love this site. I am a new vegan and this site is very helpful! Great recipe! Love the portabella and the herbs. Served with quinoa.